The General Prologue opens with a description of April showers and the return of spring. “Whan that Aprill with his shoures soote / The droghte of March hath perced to the roote,” he begins, and writes about the burgeoning flowers and singing birds. The sun has gone through the second half of the zodiacal sign Aires, the “Ram.” Budding, lust-filled springtime is also the time when people desire to go on pilgrimage, and travelers from all corners of England make the journey to Canterbury Cathedral to seek the help of the blessed martyr. The first sentence of the General Prologue, is one of the most important 18 lines of poetry in English. Writers ever since Chaucer’s day have used and responded to this expression of springtime. The combination of the awakening physical landscape with the desire to go on pilgrimage mixes bodily lust with religious zeal. The pilgrims seek help from the martyr St. Thomas à Becket. Chaucer, the narrator, who is preparing to go on pilgrimage, is staying at the Tabard Inn, a tavern in Southwark. A diverse company of twenty-nine other pilgrims enter the inn, and the narrator joins their group. The diversity of the company traveling to Canterbury emphasizes that people from all levels of medieval society take the same journey. The narrator and the other pilgrims drink, and they decide they will start their journey together the next morning. But before they begin, the narrator pauses the story to introduce the reader to the array of travelers in the company, saying that he will describe how each one of them seemed to him. Not only does the narrator of the story become one of the characters in it, he also makes the reader aware of his presence as an author: these are his individual perceptions and judgments of appearance. The narrator begins by describing the Knight, a noble man who loves chivalry and fights for truth and honor. The knight has travelled through Christian and heathen territories––Alexandria, Prussia, Russia, Lithuania, Granada, Morocco, Turkey––and has been victorious everywhere and universally praised for his valor. But his exploits are always conducted for love of Christ, not love of glory. The narrator is sincere in his description of the Knight as a noble, chivalrous man, determined to fight for the glory of God and always victorious. Unlike many of Chaucer’s portraits, which satirize the figure being shown, Chaucer is genuine in his praise for the Knight. In addition to being worthy and brave, says the narrator, the Knight is modest and meek as a maid. He never speaks ill of anyone. He wears modest clothes, and his mail is stained with rust. The Knight’s stained, modest clothes show that he truly fights well and is not showy or vain. The narrator next describes the Knight’s son, a Squire, who is a lively and lusty young knight in training. The Squire has curled hair and, though only of moderate height, is marvelously agile. He has taken part in chivalric expeditions in Flanders and northern France. The Squire is not yet as noble and experienced as his father: though he is learning all the proper ways to be a good knight, he is still youthful and somewhat vain. The Squire, says the narrator, wants to find favor with his lady. His tunic is embroidered with flowers, as if he had gathered a meadow and sewn it to his clothes, and his gown is short with wide sleeves. The Squire is constantly singing and playing the flute. He can also joust, dance, draw, and write well. The Squire is so passionately in love that he sleeps no more than a nightingale. He is always courteous, humble, and modest. Unlike the Knight, who dresses modestly so as not to show off, the young Squire wears elaborately decorated clothing that reveals him as a lusty youth as well as a fighter. He displays all the skills of a courtly lover. But although the Squire is a bit vain, he does always act in accordance with his social position. The only servant the Knight has with him is the Yeoman, who wears a green hood and coat. The Yeoman takes great care of his bow and sharp, keen peacock arrows. He has closely cropped hair and tanned skin. On his arm he wears a bright arm guard and carried a sword as well as a dagger. The Yeoman also wears a badge of St. Christopher. The narrator guesses that, according to the Yeoman’s dress, he is a forester. Even though the Knight is noble, he is shown as humble, as befits a good knight, because he only travels with one servant. The fact that he has a Yeoman also shows that the Knight owns land because he needs a forester to maintain it. The narrator next describes the Prioress, a nun named Madame Eglentyne. She sings the liturgy through her nose. She speaks French elegantly, though in an English accent. She has excellent table manners: she never lets a morsel of meat fall from her mouth onto her breast, nor does she dip her fingers into the sauce. She wipes her lips so clean that not a speck of grease remains after a meal. The Prioress takes pains to imitate courtly manners and to remain dignified at all times. The narrator’s fawning description of the Prioress is mocking, emphasizing her fastidious airs and her affected mannerisms. She believes she sings well, but she intones in straight through her nose. The fact that the Prioress speaks French shows her desire to adopt the behaviors of a noble lady, since French was the language of the court. The Prioress is so charitable and compassionate, the narrator says, that whenever she sees a mouse caught and bleeding in a trap, she weeps. She keeps small dogs, feeding them roast meat, milk, and fine white bread, and she weeps if any of them are trampled or if men beat them with a switch. The narrator sarcastically portrays the Prioress as a wimp, squealing every time she sees a dead mouse. In the name of her compassion, she also spoils her little pet dogs. The Prioress pretends to be dainty, but the narrator sardonically observes that she is a rather large woman, which explains why he knows her table manners so well. Her fancy rosary suggests that the Prioress is more devoted to earthly possessions than to Christ. The narrator notes that a second nun rides with the Prioress as well as a chaplain and three priests; however, these characters are only mentioned in passing in the General Prologue. Although only mentioned in passing here, the Second Nun and one of the Nun’s Priests later tell their own tales. Next there comes a handsome Monk who conducts business outside the monastery. When he rides through the country, men can hear his bridle jingling as loud as the chapel bell. This monk is of the old, somewhat strict Benedictine order, but he lets the old ideas pass away to follow new customs. The Monk scoffs at the notion that monks cannot be holy if they go hunting and scorns the text that claims that a monk out of his cloister is not worth an oyster. The narrator claims to agree: why waste away indoors, and do as Augustine ordained? Let Augustine do his own work! The narrator satirizes the contemporary non-devout life of monks through his portrait of the jolly huntsman. By pretending to agree that monks should abandon the commands of their orders and go hunting instead of studying in cloisters, the narrator mocks the corruption he sees in medieval monasteries. The Monk is a good horseman and rides along with a pack of swift greyhounds. His sleeves are trimmed with expensive squirrel fur, and his hood is fastened with a gold pin into an elaborate knot. His head is bald, and his face glows as if he had been rubbed with oil. He is a plump, lively man whose eyes gleam like fire under a cauldron. The plump, robust Monk resembles a prosperous lord rather than a scholar who spends his days pouring over his books. Instead of dressing in modest, pious attire, the Monk wears fine furs and shows off his material wealth. The merry, wanton Friar is licensed to beg in a certain district. Of all the orders of Friars, his is the most inclined to gossip. The Friar has arranged and paid for many marriages of young ladies. He is well known to all the rich landowners and wealthy women in town, as he has full powers of confession and could absolve any sins sweetly and pleasantly. Many a man is so hard of heart, says the narrator, that he cannot weep for his sins: instead of tears and prayers, these men give silver to poor friars. Medieval friars were mendicants: they took a vow of poverty, were not allowed to work, and had to rely on the charity of others for their livelihood. Arranging young ladies’ marriages suggests that the Friar did so because he first made the women pregnant. The wily Friar hears the confessions of the wealthy landowners and gives them easy penance to make more money, twisting the spiritual intention of his office to his own material well-being. The Friar is an excellent singer and knew every innkeeper and barmaid in every town. He disdains lepers and beggars as unworthy: instead, he deals with rich men with whom he can make a profit. Whenever he can make money, there is no man so virtuous. On days when conflicts are resolved, the Friar behaves not like a cloistered cleric but like a master or pope, donning an expensive cloak and frolicking. This friar, whose name is Hubert, also has a lisp. Saint Francis, the founder of the Order of Friars, famously spent his life treating lepers and beggars. This hypocritical Friar abuses his office to make money instead of concentrating his efforts on helping those who need aid. Instead of remaining pious and true to his vows, the lusty Friar cavorts in expensive clothes. The detail of his lisp turns him into an even more ridiculous figure. A Merchant with a forked beard is also among the company. He is dressed in a multicolor cloak, fur hat, and boots. He speaks slowly, weighing the profit of expressing his opinions. He is good at borrowing money and was so dignified in business that no one can tell he was in debt, the narrator claims. The narrator says that the Merchant hides being in debt with his flashy boots and nice hat, but the fact that even the narrator knows about his debt shows that everyone else must know about it too. The Clerk is an Oxford University student, thin and dressed in threadbare clothes. He would rather have books than fine clothes or money. Though he is a philosopher, he has not found the philosopher’s stone: what little money he has, he spends on books. He takes his studies very seriously, and whenever he speaks, his speech is full of moral virtue. The narrator is satirizing the stereotype of the poor, emaciated scholar who spends all his money on books rather than on practicalities like food and clothing; however, the narrator does admit—and seem to admire—that the student truly loves knowledge. The wise and prudent Man of Laws is very well respected and highly sought after for his legal assistance. He is an excellent buyer of land. The Man of Laws is extremely busy and pretends to be even busier than he is. No one could ever find a flaw in his legal documents. The Man of Laws is a social climber, a hard worker attempting to climb up the ranks through skill and networking. Next in the company comes the Franklin, a white-bearded, cheerful landowner whose main goal in life is pleasure and delight. He gives such elaborate meals that it seems to snow meat and drink in his house. He offers any dainty treat that men could think of. The food changes with the seasons, but it is always abundant. A franklin, or gentleman landowner, was expected to provide generous meals and entertainment in medieval society. His actions are in line with the Greek philosopher Epicurus, who said that happiness comes through pleasure. Five guildsmen are among the company: a Haberdasher, a Carpenter, a Weaver, a Dyer, and a Tapestry-Maker. They are dressed well, with brightly polished belts and knives. Any one of them, says the narrator, could have been an alderman, as their wives would agree. The guildsmen only appear in the General Prologue. Even though they fancy themselves to be important town personages, the narrator does not give them individual personalities, and they don’t tell their own tales. The guildsmen hired a Cook for the journey. The Cook, Roger de Ware, is very skillful, but the narrator is repulsed by the pus-filled ulcer on his shin. Roger de Ware is one of several pilgrims in the Tales who is based on a real person. A Shipman rides as well as he could on a carthorse. He wears a dagger around his neck. When he was on his ship, he stole wine from the merchant, whose goods he was transporting, while the merchant slept. The Shipman knows all about navigation and the tides: his beard has been shaken with many a tempest. The Shipman is not a good horseman because he is not used to traveling on land. Although it is his job to transport goods safely, he shows no scruples at skimming a little off the top for himself. The Physician bases his medical practice on principles of astronomy and diagnoses the cause of every malady based on the four humors: hot, cold, moist, and dry. He can quote all the ancient medical texts but knows very little about the Bible. The Physician practices moderation in his diet. Though he wears taffeta robes, he saved much of what he earned: gold is the best medicine, the narrator says, and the Physician therefore loves gold best. The narrator’s portrait of the Physician is neither uniformly complimentary nor entirely satirical. The Physician is genuinely a man of learning and practices a moderate lifestyle, yet he pursues his career not for love of knowledge but for love of gold. The slightly deaf Wife of Bath, an excellent seamstress, is always first in line at parish offerings. If anyone brings alms before her, she becomes extremely angry. On her way to Sunday mass, she wraps her head in scarves that the narrator says must weigh ten pounds. Her stockings are as bright red as her face. The Wife of Bath, one of the few female pilgrims, is one of Chaucer’s most entertaining and lively characters. She is proud and quick-tempered. Her red face and stockings come from medieval stereotypes that red is the color of lust. The Wife of Bath has been married five times (not to mention her other “company”) and has gone on three pilgrimages to Jerusalem; she has also visited Rome, Cologne, and other foreign pilgrimage sites. She is gap-toothed; sits easily on her horse; and wears a wimple, an overskirt over her broad hips, and sharp spurs. The Wife of Bath gives excellent advice in matters of love, having a great deal of expertise. The Wife of Bath speaks from the voice of authority, and although she is no longer young and beautiful, she has a wealth of worldly knowledge. She is probably a widow, because only women who have been widowed would have the money and power to travel as widely and freely as she does. A Parson from a small town is also among the company. He is poor in wealth but rich in holy thoughts and deeds. The Parson devotedly teaches the members of his parish, but he is loathe to tithe them. Neither rain nor thunder nor sickness prevents him from visiting his parishioners: he picks up his staff and walk to all corners of his parish. In words and deeds, he gives his flock a noble example. He is even kind to sinners. He is a shepherd, not a mercenary. The Parson wants to draw people closer to God through graciousness and kindness. He never adopts a fussy manner and always stays true to Christ’s teachings. In contrast with the satirical portraits of the mincing Prioress, the hunting Monk, and the hypocritical Friar, the Parson is described in sincere terms as a devoted servant of the Lord. Unlike the Friar, who takes money from rich landowners, the Parson is reluctant to make poor people pay, instead covering the tithes himself if necessary. The Parson’s brother, the Plowman, is a faithful worker who worships God and loves his neighbor as he loves himself. He threshes hay for Christ’s sake and always pays his tithes fully; he wears a loose workman’s tunic and rides on a mare. Chaucer’s Plowman falls in a long line of literary Christian plowman, including William Langland’s book Piers Plowman, which was written slightly before the Canterbury Tales. By assuring the reader that he is almost done describing the company the narrator asserts his authorial control. The Miller is a rough, bawdy peasant with none of the fine airs of daintier pilgrims in higher stations. The “thumb of gold” is an ironic reference to a proverb: the narrator is implying that there are no honest millers. The Manciple, a businessman who supplies a school of law with provisions, is always ahead in his dealings: even though he is uneducated, he is more clever than the lawyers he serves and is able to deceive them all. The lawyers serve the people, and the Manciple is supposed to serve the lawyers, but he is so shrewd and conniving that the lawyers unknowingly end up serving the Manciple. The Reeve is a slender, choleric man with a closely cropped beard and stick-thin legs. No auditor can ever catch him: he knows the accounts of his lord’s estate extremely well, and all the farm-managers, herdsmen, and servants fear him. The miserly Reeve has hoarded so much money that he is wealthier than his lord. He is a talented carpenter, and he always rides last among the company. The miserly, wily Reeve knows all the tricks of servants and managers because he uses them himself. Instead of working for his master’s gain, he steals from the master and jealously hoards all the money that he skims off the top of his dealings. That he rides last indicates the way he surveys others and sits in the shadows, gathering money and power. The Summoner has a disease that makes his face bright red and pimpled, gives him scaly skin, and makes his beard fall out. No medicine or ointment can treat the pustules. He loves onions and garlic, and when he drinks, he speaks only in Latin––at least, the few Latin phrases he knows. He is a buffoon, a good fellow: for a quart of wine, he will allow a man to keep his mistress for a year and excuse him in full. The Summoner is another one of the religious figures in the Tales who is not as devout as one would expect someone in his office to be. Summoners were supposed to call people before the church court to confess their crimes, but this Summoner can be bought off easily because he cares primarily about his own pleasures. The Summoner also knows how to swindle people. If a man’s soul is in his purse, he says, in his purse he should be punished. But the narrator knows that wicked men need to fear execution as well. The Summoner also is the sole counselor for all the young women of his diocese. His staff is the sign of an ale-house, and his shield is a cake of bread. The Summoner is just as unappealing on the inside as on the outside: he swindles people by taking their money instead of sending them before the church court, and he is also lecherous, making himself the “counselor” of all the local young ladies. The Pardoner, coming straight from the court of Rome, rides with the Summoner. He has thin yellow hair that he loops over his shoulders in long, elaborate strands, and to show it off, he rides bareheaded. His voice is as high as a goat’s. The Pardoner has a wallet stuffed full of pardons from Rome as well as many religious trinkets, such as veils, goblets, and decorated crucifixes. He also has pigs’ bones in a glass reliquary, which he tells poor people are relics from holy saints. He uses false flattery to make fools of both priests and laypeople. However, the Pardoner is a good singer and storyteller. The Pardoner’s mincing, vain, feminine appearance have led many commentators to speculate that Chaucer is painting a picture of him as a homosexual. The Pardoner gleefully exploits the poor, gullible people in his parish, showing them cheap trinkets and bones from Rome and pretending that they are valuable relics. After providing descriptions of all the pilgrims who have assembled at the tavern in Southwark, the narrator begs the reader’s forgiveness for anything unseemly in the tales, as the narrator is simply trying to report the pilgrims’ words and characters as plainly and truthfully as he can. Whoever tells a tale about a man, he says, must repeat it word for word so that he does not tell falsehoods or make up words. As Plato says––for those who can read Plato––the word must be cousin to the deed. The narrator says that he has described the people to their full degree in plain language so that the reader will understand. The narrator poses as simply an innocent bystander, a reporter dedicated to presenting as fair and honest a portrait of each of the pilgrims as possible. Chaucer presents his narrative style as being as clear as possible so that all readers will be able to understand what he is saying. This pose of humility also allows Chaucer as the narrator to present each of the pilgrim’s stories in a very different narrative style according to the type of character he or she portrays. The narrator returns to the story of the first night he spent with the pilgrims. The merry Host, an excellent master of ceremonies and a fine citizen of Cheapside, puts everyone in a cheerful mood by serving a merry supper. After supper, when everyone has paid their bills, the host tells the pilgrims that they are the merriest company he has had under his roof all year and that he will add to their mirth free of charge. The Host is a somewhat separate figure from the rest of the pilgrims: though he is an important character, he is not one of the tale-tellers and does not get his own portrait in the General Prologue. The Host proposes that instead of riding dumb as a stone to Canterbury, the pilgrims should tell each other tales along the way to keep each other amused. The Host says that he would judge the tales, and that if they play the game he has invented, he sears by his dead father’s soul that they will be entertained. By a unanimous show of hands, the company agrees to take his advice. The Host serves as yet another layer of narrator: we have Chaucer the author of all the Tales; Chaucer the narrator, one of the pilgrims on the journey who both observes all the other pilgrims and gets to tell tales himself; and the Host, the guide to the tale-telling game. Delighted, the Host explains the game: Each pilgrim will tell two tales on the way to Canterbury and two more on the way home. Whoever tells the best stories––that is to say, the ones that give the most significance and most pleasure––will have a free meal at the tavern upon his return, paid for by all the rest of the pilgrims. The Host decides that he will ride with the pilgrims, at his own cost, to serve as their guide in this merriment. Any pilgrim that disagrees with his judgment will have to pay all the expenses of the journey. 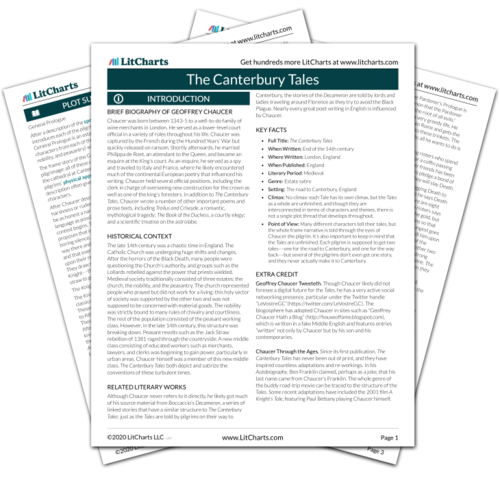 The narrator presents the Canterbury Tales through the frame narrative of the Host’s game. The Canterbury Tales as they stand today appear, by the Host’s explanation of the game, to be incomplete: each pilgrim is supposed to tell two tales on the way there and on the way back, yet not every pilgrim gets even one tale, and they don’t make it to Canterbury, let alone back. The pilgrims agree to the plan and beg the Host to serve not only as their guide but as governor, tale judger, and record-keeper. The pilgrims are uniformly delighted to treat the expedition to Canterbury as a form of entertainment rather than a pious religious journey. The next morning, the Host, like a rooster, wakes up all the pilgrims and gathers them together. After they ride a mile or two, the Host reminds them of the agreements of the night before. The Host says that they must draw straws to see who will tell the first tale. He gives the privilege of drawing the first straw to the Knight, in deference to his rank. The Knight draws the short straw and nobly accepts the challenge. Even though the system of choosing straws is supposedly democratic, it is perhaps not entirely by chance that the Knight begins the tale-telling game. While the pilgrims are from all different socioeconomic backgrounds, medieval society is still very hierarchical, with the knight at the top. It seems likely that the Host rigged the game. Raphel, Adrienne. "The Canterbury Tales The General Prologue." LitCharts. LitCharts LLC, 8 Nov 2013. Web. 20 Apr 2019. Raphel, Adrienne. "The Canterbury Tales The General Prologue." LitCharts LLC, November 8, 2013. 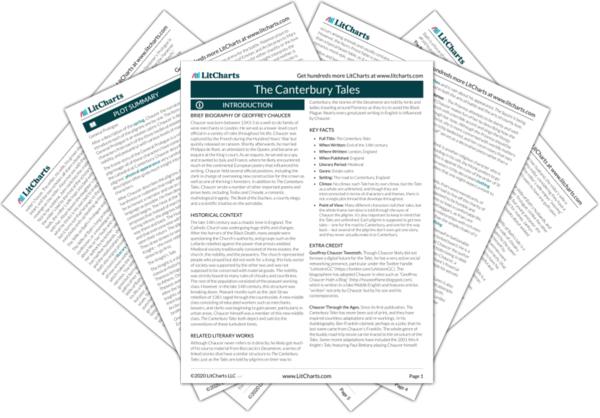 Retrieved April 20, 2019. https://www.litcharts.com/lit/the-canterbury-tales/general-prologue.